Birthday parties as a kid usually meant a day at the arcade. I can remember not being able to sleep the night before a friend’s party; the anticipation was too much. The old Atari 2600, sorry to say, just wasn’t the same as that dark, black-lit room, buzzing with lights and beeps and the bright marquees of our favorite video games. Unless you were as cool as Ricky Schroder (I’ve been dying to make a Silver Spoons reference), who literally had an arcade in his living room, you had to settle for the next best thing. Marketed as ‘The arcade games you can take home with you,’ the Coleco Mini-Arcade tabletop series were probably the coolest of the hand held video games of the 80s. 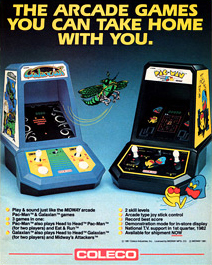 These arcade miniatures, first introduced in 1981, were by far the most realistic, portable gaming experience of their day. Ok, arguably, they weren’t that portable (hence the name tabletop), but they definitely had the look and feel of their larger originals. 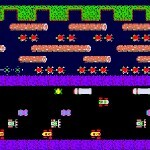 Re-creating the arcade experience represented the biggest challenge for home-based video games; in the early days, the technology we could experience at home was a bit crude. The closer the game was to the originals—we all remember dumping our hard earned quarters in at Chuck E. Cheese or that movie theater game room—the better. For just under $60 (that’s about $152 in today’s money) you could own one of several of these gems, including Frogger, Donkey Kong, Pac Man, Ms. Pac Man, Galaxian and Zaxxon, and Donkey Kong Jr. (which looked a little different than the others – see below). 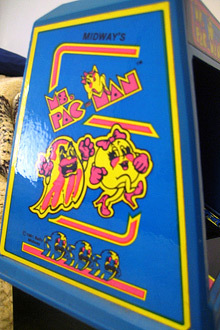 What set these games apart from others at the time was the design—a smaller version of the original full-size arcade game. They not only had the look of a standup arcade game cabinet, but they had the side art, the marquee (unlit), and cool artwork on the glass of the multi-colored VFD display. They even had demo modes—all done to replicate the original. 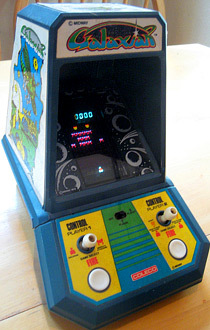 The game that did the best job of representing the original was Galaxian; it really looks and sounds like the arcade version. Zaxxon was rather large and looked a little different than the others, mainly because it needed mirrors and two displays on the inside to achieve the infamous 3D effect for which the original was known. 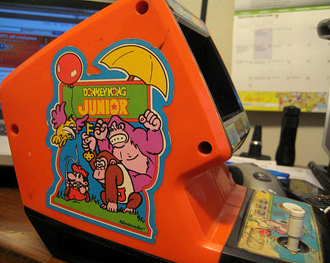 Then there was Donkey Kong Jr. Coleco planned to make DK Jr. look like the others, but for whatever reason, they scrapped the idea. 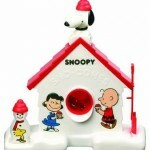 Instead, it was really just a re-branded version of Nintendo’s tabletop game and watch model, but with better artwork. 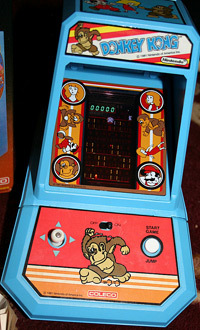 The Donkey Kong Jr. game is the most challenging one to play. Because it uses a color LCD display, you need to have it under a light source (no playing in the dark when you were supposed to be asleep)—very different from the bright VFD displays of the other games. 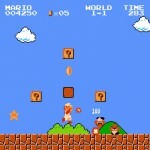 In the 80s, these games were so popular that they occasionally made cameo appearances in movies and TV shows. 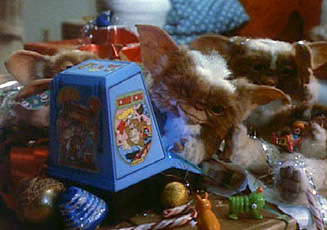 In the movie Gremlins, there’s a scene when the evil Mogwai ‘Stripe’ is playing Donkey Kong. 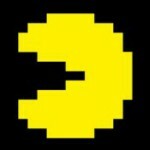 Pac Man made an appearance in both National Lampoon’s Vacation and an episode of Knight Rider (S1, E21, Nobody Does It Better). 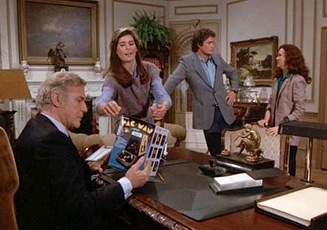 Image copyright of Warner Bros. Pictures. Image copyright of Universal Television. There were many other tabletop-style games that came out later, but very few manufacturers went to the lengths that Coleco did to recreate the look and feel of the full-size originals (Q*Bert by Parker Brothers is one possible exception). These games are highly collectible today; finding one on eBay in pristine condition, and still in its original box, will set you back somewhere between $200 and $300. The memories though, are priceless. 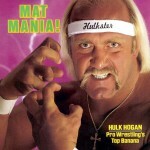 I have a few of these 80’s tabletop video games (ie – Donkey Kong, Pac Man ) records Elvis etc, watches. Just wondering if you know a site or persons who could tell me their worth and possible collectors? 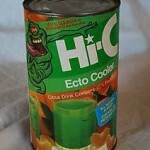 Checking the prices on ebay is probably the best place to start. Good luck! I have the whole collection of these Coleco handhelds (Galaxian, Pac Man, Mrs. Pac Man, Donkey Kong, Frogger, and Zaxxon)they are amazing!!! Primative by modern standards, but fun nevertheless they are a worthy addition to any gameroom or 80s collection! !